OK, I'll freely admit that this week's free resource is not exactly new. Sure, it may be new to you, but this Frugal GM has been touting the awesomeness of Dungeon Crafter III ever since I started this blog. "No way man, I've been reading your posts and this is the first I ever heard of Dungeon Crafter III!" If this highly imaginative and speculative statement fits you then all I can say is that you should really look at the other pages. All the posts are on the main pages, but there were two other pages you might find interesting. The first is a Table of Contents page and the next is the +12 Links of Helpfulness. 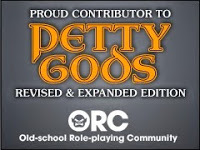 If you haven't looked at the links, then you are just doing yourself a disservice. ....anyway, back to Dungeon Crafter III. I've highlighted programs for overland maps and some great resources for detailed interior maps, but what do you do when you just need a simple map you don't want to spend a lot of time on. 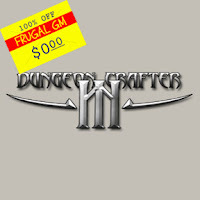 This Frugal GM uses Dungeon Crafter III. Dungeon Crafter III (seriously, do I need to make any more links to it for you guys?) 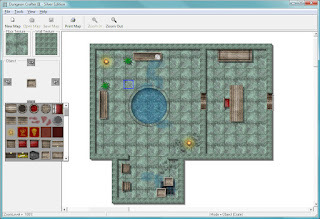 is a small freeware program that lets you lay down walls, floors, doors, and objects. You can download a few different tilesets and can be creating your new maps in minutes. The only thing I have found quicker is a simple hand-drawn sketch. If you draw like me then you'll appreciate Dungeon Crafter III even more! I usually make a quick map, save it, and then open it in Photoshop for a quick re-size or mark-up for room numbers. Usually I use DCIII maps in my convention adventure submissions or in those places where I need a better detailed map, but not a highly detailed (as in battlemat quality) map. Maps done up in DCIII are great for use with online games because of the scale involved. Even if you don't need this kind of map often, it is worth checking out Dungeon Crafter III just so you have it in your GM toolkit should the need arise. 2012.12.11 UPDATE: It has come to my attention that Dungeon Crafter III's website is down and the status of this program's availability is unknown. You may be able to get a copy from other sources at your own risk. I've left the links up on this page in case it comes back, but I have disabled them on the +12 Links of Helpfulness. 2015.04.09 MORE UPDATE: Ugh...it looks like somebody got the domain that was linked all over on this page and forwarded it to a crappy spam/phishing site. I've removed the links. Work on the program was on hiatus, but the files and website were still available for the longest time. There are copies available on assorted download sites and probably as torrents, but I'm usually wary about getting files, much less executable files from torrents. I've tried three. They were loaded with malware. Just so folks know. That is a shame. This was a pretty good way of making maps....I hope it resurfaces sometime soon. This worked for me: http://www.download3k.com/Install-Dungeon-Crafter-III-Silver-Edition.html - scanned it with Avast! Free anti-virus before I installed it, saw no sign of malware. Ran it and got no strange pop-ups etc. Running it on Windows 7, seems to work fine.